When you need items palletized and shrink wrapped, NYC Shrink Wrapping can take care of your needs. Our experienced shrink wrap packaging team will load and secure your items on a pallet and we will secure and wrap your items. We will send an experienced technician to your facility with all of the necessary materials. 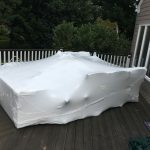 Whether you are shipping products to your customers, moving your entire operation or just need to move a couch, sofa or desk, NYC Shrink Wrapping can help keep your items safe during transportation and shipping.